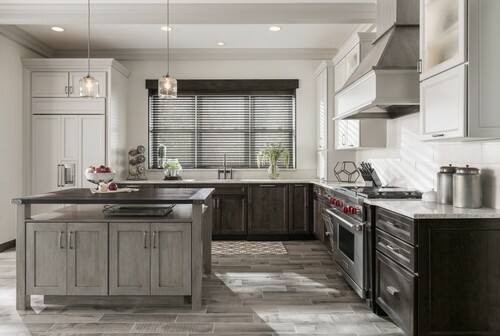 There’s no denying that the kitchen has become the focal point of the modern home, the place where the outsize influence of the Food Network and HGTV converge. Prospective buyers want to imagine themselves gathered there among friends, sipping wine and nibbling on hors d’oeuvres with ease—or perhaps preparing a family meal while the kids pitch in as little sous-chefs. But achieving that dream kitchen is also one of the most expensive home remodeling projects you can possibly undertake. If your taste trends more toward Veuve Clicquot on a budget that’s solidly PBR, never fear: We’ve got some sneaky tricks to give your kitchen a fancy upgrade on the cheap. “These work best and convey a really luxe vibe,” she says. “Look at the branding colors of luxury designers—they are mostly lightly muted and off the primary color.” She favors charcoal, cream, and champagne over harsher black, white, silver, or gold. And consider texture when you’re planning your palette. Think of varying high-gloss, matte, and distressed finishes, and using raised patterns. 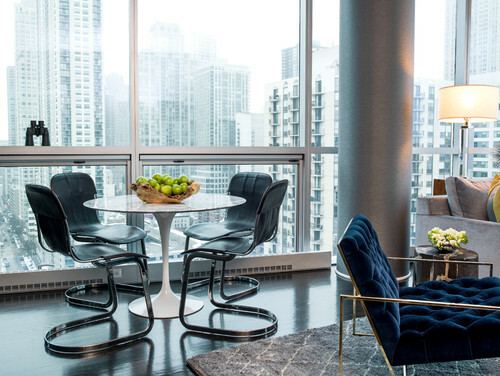 And don’t be afraid to mix metals, says Maize Jacobs-Brichford, a designer and project manager at Brynn Olsen Design Group in Chicago, who favors clean, traditional lines in unlacquered brass or polished nickel. “Even if your sink or lighting is chrome, your hardware can still go brass,” she says. When it comes to tired old cabinets (particularly the stalwart oak cabinets of the ’80s), a good coat of paint can hide all manner of sins, according to Hoffmann. We like Ace Hardware’s Cabinet, Door & Trim Paint, a semigloss alkyd enamel paint that promises a smooth finish. If you’re a clumsy DIY painter (are those brush strokes? ), hire a pro. Invest a little in new stemware. 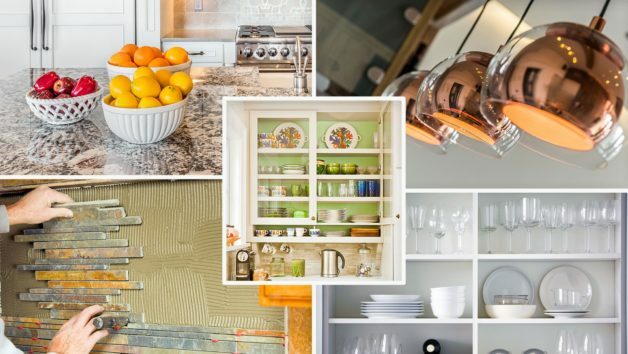 If you have a bit of cash to spend, splurge on a gorgeous open shelf (or consider glass-front cabinets) to display pretty colored or textured glass, like these from Epitome Home. Hoffmann also swears by dimmable lighting. “Get an electrician to put your lights on a dimmer, and instantly upgrade the feel of your kitchen, especially at night or when entertaining,” she says. 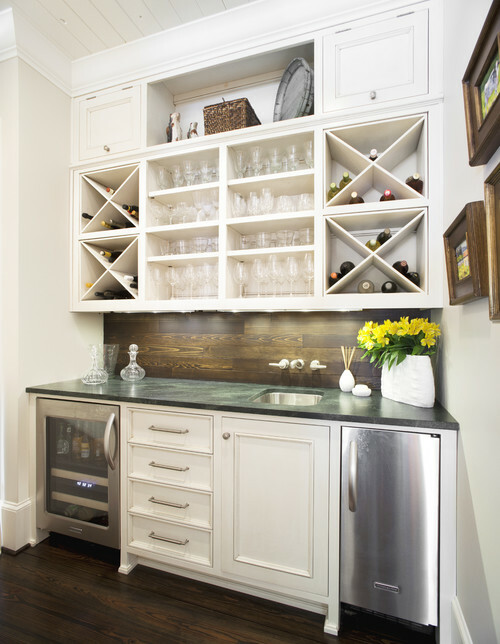 And finally, don’t forget about task lighting—particularly under-cabinet lights. Battery-powered LED lights are inexpensive and couldn’t be easier to install (in many cases, you just stick them on using removable adhesive). 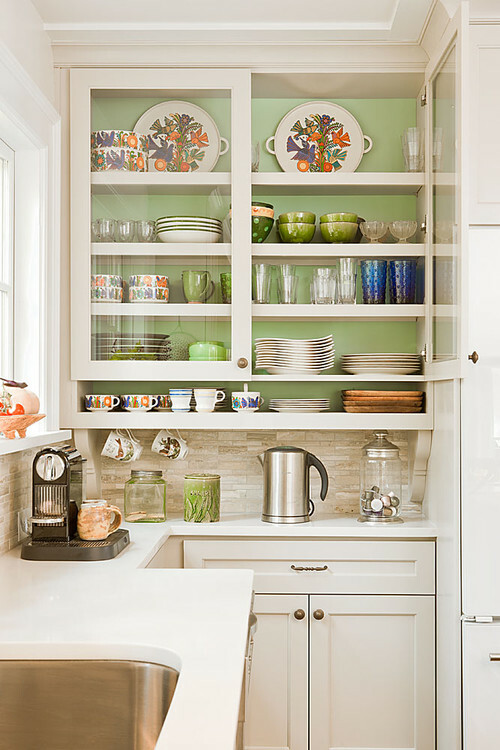 Position them under cabinets in the areas where you typically spend the most time. 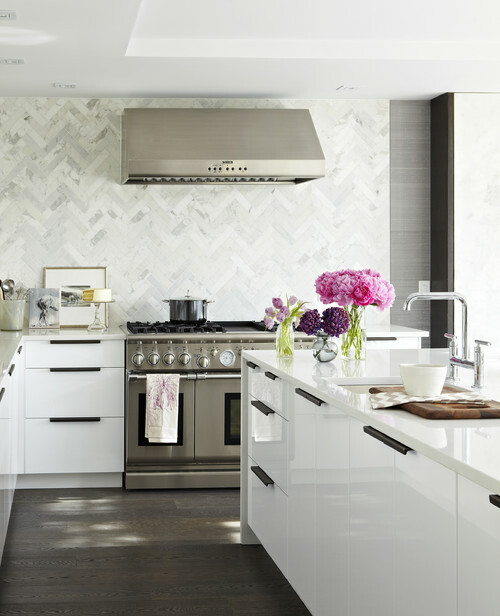 After cabinets, a backsplash makes the biggest statement in a kitchen. This is one place you want to splurge, pros say. 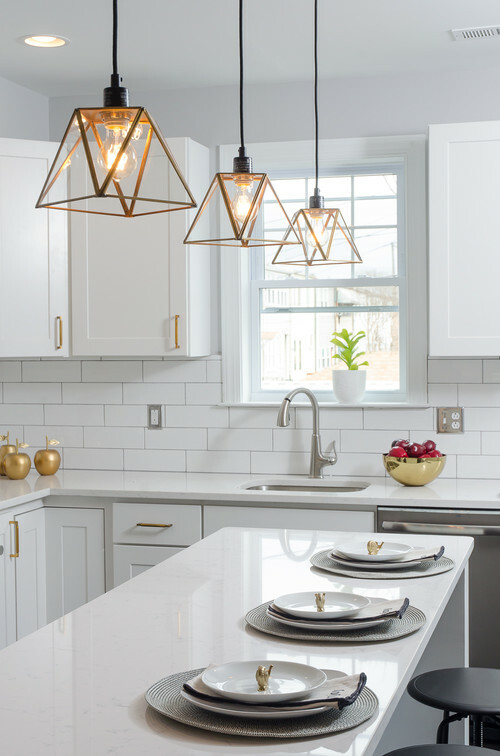 “It’s a great place to showcase your personal style and taste,” says Hoffmann, who favors monochromatic trends like concrete, herringbone, and subway tile. If you’re on a budget, reinvigorate your backsplash without mortar by using a simpler, adhesive-based product like SimpleMat. Hoffmann swears by window appliqués to fake a great view outside a kitchen window. These also add visual interest if the area isn’t conducive to traditional window treatments, she says. Another great trick? Hang ferns or other flowers outside your windows to give the illusion of lush, verdant space. 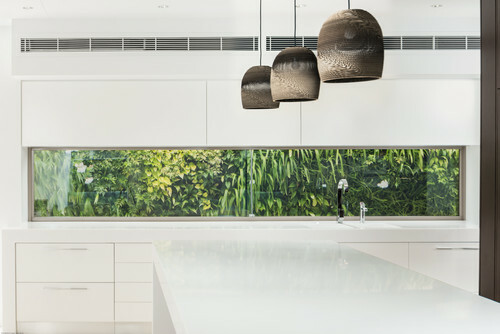 Hoffmann also likes to add herb gardens to the counter space, over the sink, or just outside windows. Innovative new products from companies like Giani Granite and Rust-Oleum let you paint (yes, paint!) 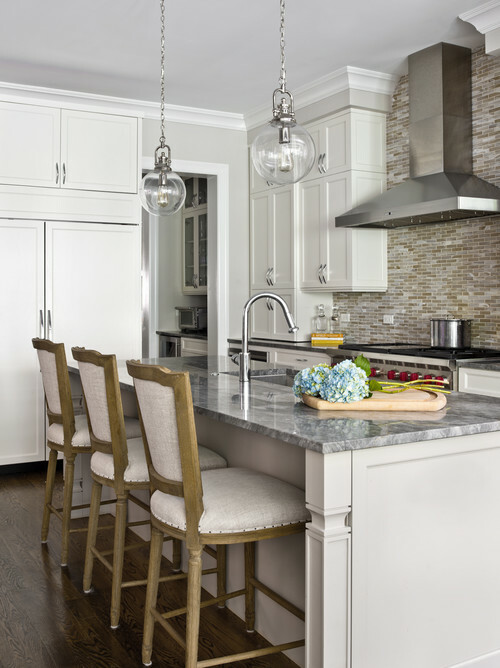 your dingy old wood or laminate countertops if new granite or slab isn’t in the budget. You can go for a textured imitation stone look, or keep things cohesive with a simple solid color. Bring life to a kitchen with a driftwood bowl filled with a bright fruit or vegetables; Jacobs-Brichford likes lemons, artichokes, or green apples. “They can usually sit out for two weeks—much longer than the life span of flowers,” she says. (Fake fruit is fine in a pinch, though designers prefer the real thing.) If you’re staging your home to sell, consider adding fruit to your kitchen to give it an attractively livable feel. The (admittedly pricey) diffuser uses perfume-grade oils, gives off a more understated scent than traditional candles, and lasts an entire year.